1. 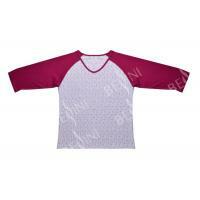 Soft fabric 65%polyester 35%cotton jersey 160gsm. 3. Long sleeve top,round neck,plain pink color. 4. Long pants,allover print,ivory ground with red/gery love hearts print. 5. Placement print at the front of the top. 1. The fabric handfeel is very soft. 2. Allover print fabric back neck patch of the top,half-moon shape. 3. Self fabric bingding around the neckline. 4. 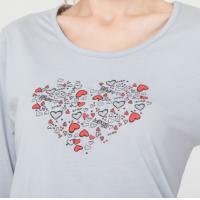 One big placement print on the CF.The print is heart shape with many small hearts and letters as the trousers' print. 5. Elastic waist and grey waist tie for the trousers. This long sleeve pajama set is for Autumn season.Our fabric will let you feel soft. Our print is water printing.All the dyeing material is environmental. This garment is body-building design.Wearing it,you can get both cosiness and elegance.